USA Book News award goes to Zing! By Gorji as winner in the International cookbook category for 2014. In this colorful and easy to read book, Chef Gorji spills the secrets behind his headline making New Mediterranean Cuisine recipes at his restaurant Canary By Gorji in Dallas Texas. Chef Gorji’s creative take on cooking philosophies mixes science and old world hot and cold theories to create his unique recipes. And in this debut cookbook, he shows new and simple ways to add bold and savory flavors with ingredients such as pomegranates, sumac, barberries, grapefruit, and capers. Zing! 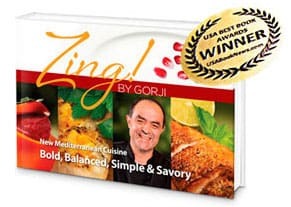 By Gorji cookbook with reader-friendly, easy to follow recipes is a collection of his favorite signature dishes that have garnered critical acclaim. He won the Texas Steak Cook-off Championship twice with his take on steak with pomegranates! Food lovers can find the chef’s award-winning cookbook at the following stores and websites. No Replies to "USA Book News Award Win By New Mediterranean Cookbook"